What Are The Advantages Of Supermarket Chains Flake Ice Machine? 1. The Supermarket Chains Flake Ice Machine adopts the PLC programmable control system to realize the control. The running performance is stable, safe and reliable. The user can control the automatic start and automatic stop time of the flake ice machine according to the power consumption to save energy and fully automatic control. 2, compared with other ice machine, the ice machine is fast, the ice can be made in 1 minute, the ice is continuous, and it is easy to use. 3, the cost is low, the production cost of ice is very economical, it takes only about 80 degrees of electricity to cool 16 degrees Celsius water into 1 ton of ice. 4, the machine from Supermarket Chains Flake Ice Machine Factory is equipped with a variety of protection devices such as high and low pressure, water cut, limit, overload, etc., which further enhances the safety and stability of the ice machine, allowing the user to directly stop power and stop making ice when no ice is needed. The internal structure of the evaporator is simple, and the components have high versatility, so the operation is reliable, the maintenance is convenient, and the maintenance is easy. 5. 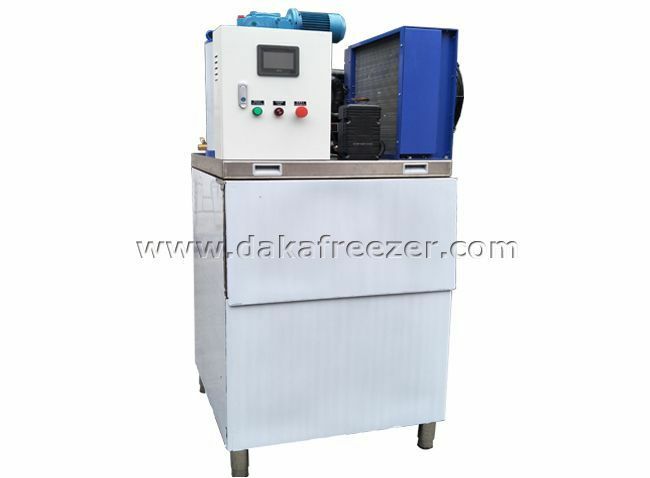 The flake ice machine adopts fully automatic control, and the operator can operate by pressing the switch. The material of the evaporator is made of imported 304 stainless steel or heat-transfer efficient carbon steel surface plating hard enamel to ensure the super corrosion resistance of the ice bucket and the cleanliness of the borneol. Which Size is Suitable for Seafood Markets Flake Ice Machine? What Is Cause Of The Slow Ice Making Mechanism?